The immunotherapy drug pembrolizumab, when combined with chemotherapy, doubles survival in patients with non-squamous non-small cell lung cancer (NSNSCLC) lacking genetic changes in the EGFR or ALK genes, when compared to chemotherapy alone, according to an international, Phase III clinical trial. Principal investigator Leena Gandhi, MD, PhD, director of the thoracic medical oncology program at Perlmutter Cancer Center at NYU Langone Health and associate professor of Medicine in the division of Medical Oncology at NYU School of Medicine, presented these findings April 16 at the American Association for Cancer Research (AACR) Annual Meeting 2018 in Chicago. The data from this study were simultaneously published online April 16 in the New England Journal of Medicine. A total of 616 patients with untreated, metastatic NSNSCLC without EGFR or ALK alterations, from 118 international sites, were randomly allocated for the trial—405 patients were treated with both pembrolizumab and platinum + pemetrexed, and 202 received platinum + pemetrexed with a saline placebo. Of those treated with pembrolizumab and platinum + pemetrexed, the risk of death was reduced by 51%, compared to those treated with platinum + pemetrexed alone. Among patients treated with the combination therapy, the chance of progression or death was reduced by 48%. In other words, chance of overall and progression free survival doubled. 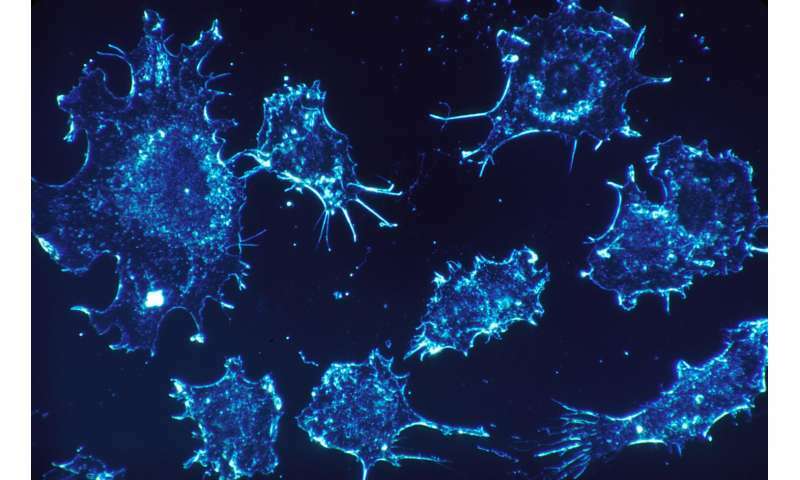 "The data show that treatment with pembrolizumab and chemotherapy together is more effective than chemotherapy alone," says Gandhi. "Using this combination therapy to treat patients with such an aggressive disease could be an important advance in keeping patients alive and well for longer." The risk of severe side effects was similar in both groups (67.2% in the combination group and 65.8% in the standard treatment group), although there was an increased risk of acute kidney injury with the combination treatment (5.2% vs. 0.5%). The most common side effects experienced by both groups were nausea, anemia and fatigue. "Although some non-small cell lung cancer patients have increased benefit of targeted therapy or immunotherapy instead of chemotherapy, for some groups of patients with NSNSCLC, chemotherapy has been the standard treatment for more than 30 years," Gandhi notes. "But for patients with NSNSLC without EGFR or ALK alterations, this study may suggest a new standard of care."